Updated: AG Reports Hooksett Double Homicide and a Suicide in Mass. Attorney General Gordon J. MacDonald, New Hampshire State Police Colonel Christopher J. Wagner, and Hooksett Police Chief Janet Bouchard announced additional information regarding an ongoing investigation into a double-homicide that occurred in Hooksett, New Hampshire. An autopsy was performed today on both June Cosma (age 79) and Thomas Cosma (age 80) by Dr. Kristin Roman determined that the cause of death for both was blunt force trauma to the head and that the manner of death was homicide. On February 3, 2019, police in Andover, Massachusetts, engaged in a high- speed chase with a car near the Andover and Lawrence town line. The car evaded officers and was later discovered abandoned in Lawrence, Massachusetts. The car was registered to June and Thomas Cosma of Hooksett, New Hampshire. An individual matching the description of the driver of the car in the police chase was found deceased of apparent suicide in close proximity to where the Cosmas’ car was found. This individual was later identified as Zachary Gloudemans (age 34). Based on this information, the Hooksett Police were requested to perform a welfare check on the Cosmas, and discovered them deceased inside their home. “There are no words that can capture the shock we’re experiencing or the sorrow we’re enduring in losing two wonderful human beings. 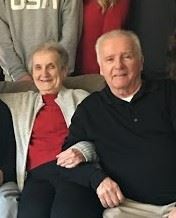 June and Thomas Cosma, known affectionately to their nieces and nephews as Auntie June and Uncle Tommy, truly cared more about others than themselves. They gave to us selflessly during their entire lives. “We are reminiscing about them in the way they both deserve to be remembered: As hard-working, caring and mindful people who were as genuine as they were kind. Rather than dwell on the circumstances of their deaths, we instead choose to remember them for how they lived. “They embraced love and caring in the purest ways, sharing those with each other during more than 50 years of marriage. They readily shared unrestrained kindness and concern for their family, friends, neighbors, church, community and others. They were truly the nicest people one could meet, and they never had a bad thing to say about anybody or anything. “We are thankful for the support we’ve found the past few days since first learning what might be and then confirming their unfathomable demise. We are grateful for the support, love and concern we have already received through heartfelt words, thoughts, prayers, calls, texts and messages. The outpouring is appreciated. As we move forward, we anticipate finding even more after others learn of this tragedy. “In addition, we’d like to express our gratitude for all the efforts by the New Hampshire State, Hooksett and Andover police departments; the New Hampshire Attorney General’s Office; and other law enforcement agencies probing the misfortune that June and Tommy suffered in their home. The earnestness, professionalism and concern extended to us must be commended.